Shimizu’s shari -- also known as sushi rice -- is quite warm, slightly saline with the structure of each grain of rice remaining distinct. For co-owner and sushi chef Lee Kwang-yeol, this is no accident. Lee, who professed a fondness for blue-skinned fish, clearly has geared his shari to suit the slick, meaty and unctuous appeal of “neta” -- sushi toppings -- like herring and mackerel. To maintain the saline flavor of Shimizu’s shari, Lee eschews sugar and limits the seasonings to salt and “akazu” (red vinegar made with sake lees). The rice itself is sourced from a farm in Gyeonggi Province’s Icheon City where it is shipped freshly milled-to-order. Sweetness plays a key role in Shimizu’s shari, not just with the rice itself but also via the temperature at which the rice is served. “Since the flavors of the salt in the shari are strong, we keep the rice warmer than one’s normal body temperature,” said Lee, who believes that the warmth of the rice heightens its natural sweetness and therefore serves shari at around 38 degrees Celsius. One can see how seriously Lee takes his shari when watching him in action. Throughout the meal, he frequently has small portions of shari replenished so that it is consistently warm from beginning to end. When crowned with neta this shari holds its own, heightening, it seems, the sweet and umami flavors of the sushi topping itself. For the chef, who has been honing skills for over eight years in both Korea and Japan, shari is important, indeed, as well as the many other components that go into the construction of sushi, including wasabi. “Wasabi acts a bridge between the neta and the shari,” said Lee, who does not skimp on the fiery, fragrant root-turned-paste when dabbing it onto shari before topping it with neta. When the components start to fuse together, from shari to wasabi to neta, the result is quite simply, delicious. Lee creates a melt-in-your-mouth, umami bite with “yari-ika” (spear squid) by slicing it horizontally into thin, wide layers. He then layers the thin slices over one another and juliennes them before molding the strands delicately over shari. Then there is his “nishin” (herring), where the warm, slightly sweet, slightly salty shari complements a thick slice of rich herring. A hint of shiso, green onion and a fragrant dab of a vibrant emerald paste crafted from ginger add an aromatic dimension to the sushi. 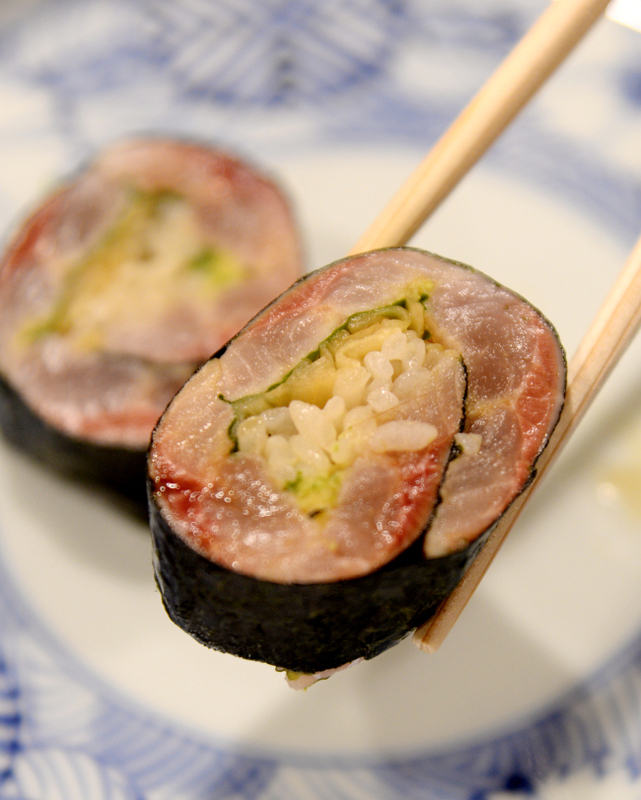 Lee displays his mastery of herring again with a truly addictive isobe maki. Lee attributes the popularity of Shimizu’s isobe maki to the use of good quality dried laver, good, fresh wasabi and housemade pickled ginger. 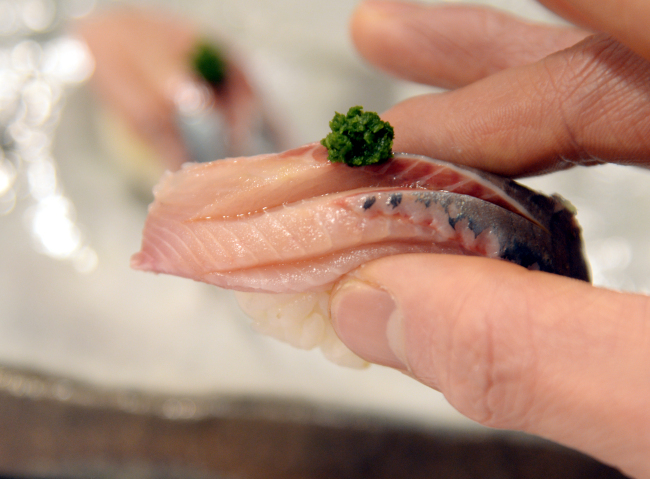 For the maki, Lee lays out a strip of dried laver and then tops it with herring, pickled ginger, shiso, wasabi and shari before rolling it and slicing it for a beautiful, fragrant bite with a slight tang. Now six months in business, Shimizu is still laying down roots from its hard-to-find perch in Seoul’s Sinsa-dong. Lee revealed plans to continue to experiment with the rice, wasabi and fish used to craft sushi at this new sushiya.